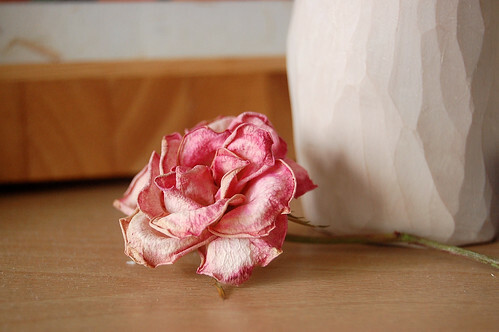 Faded Rose, originally uploaded by indiaeden. Every week we take fresh roses to Florence's grave. I sit next to her stone, I remove last weeks roses,and I sit quietly trimmimg the fresh roses and arranging them. Meanwhile Woody cleans her lantern, and lights a fresh candle. India and Eden fetch fresh water, and clean the stone. Angus and Sid run around on the grass and sometimes pick dandelions or buttercups for Florence. There is a certain grace in each of us having our role, even when there is little peace...the boys are not quiet when they are running about ! This evening, the cemetery was still, just us there. As I was removing last weeks roses, I spotted this one, and had to bring it home. Such faded beauty. I've placed it under Florence's photo in our bedroom. it is absolutely beautiful. i love the photo. i love the flower. i can almost smell it. I love your weekly family ritual for Florence. We don't visit Hope nearly enough. Only on the big days, birthdays, christmas, mother's day etc. I should go more often I guess. Your post has inspired me to do so. Gorgeous photo, and I recognise the statue behind it. Which one is it exactly? Sally, that's the "Angel Of Mine". I normally don't go for sentimental stuff like that,but that statue called to me, and Woody bought it for me in Cornwall last October. I do love it. That rose is a beauty. And the photograph is amazing - the rose almost looks as if it's a painting. Beautiful rose, and I have a wooden figure just like the one in your background, of a mother standing, cradling her baby to her shoulder. It was a gift from a friend, one of the only people who visited or called after Henry died. Somehow those little trinkets have great meaning. It's not long now for us, I have the feeling that you will be holding baby boy a few days before Baby V is set to arrive. Whoever comes first, may they bless the way for the other.